Brau Beviale, Emballage and Vinitech: an autumn dedicated to trade fairs for Makro Labelling, one of the most innovative companies in the sector of industrial labellers for the beverages, food, detergent and pharmaceutical markets at national and international level. After recently taking part in Pack Expo Chicago, Makro has now turned its attention to the most important European trade fairs dedicated to packaging and beverages. “In the quality we aim for” - declares Massimo Manzotti, President and Sales Director of Makro Labelling - “being near the customer is fundamental. This is why taking part in internationally important trade fairs is ever more crucial for us. It allows us to confirm our relationship with customers and present the latest innovations developed for the labelling sector. International trade fairs also express our propensity for exports and international markets and provide a fundamental way for demand and offer to meet, as well as an excellent opportunity for visibility." 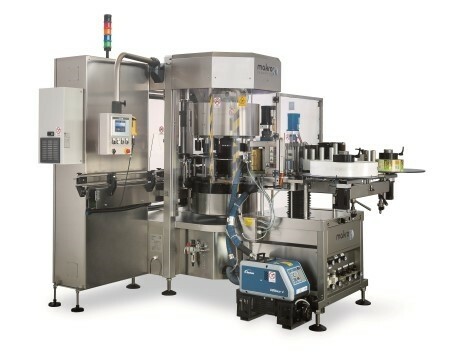 agent for North America, Makro Labelling presented two machines for the North American market: a MAK 1 - 8P RLF Roll Feed labeller designed specifically for the growing mineral water market looking for high speed application of wrap-round plastic labels on a reel, and a MAK 2 - 8P Ua2 L2 Co2 self-adhesive labeller with Follower 2 optical centring, the innovative bottle guide system guaranteeing perfectly centred labels, ideal for the spirits market. The next trade fair diary date for Makro Labelling is Brau Beviale at Nuremberg from 11 to 13 November where the company will be taking part directly, presenting the MAK 2 - 6P Ua4 L4 Co1, a self-adhesive machine with Follower 1. At the main French event aimed at the major markets of packaging users, Emballage, taking place in Paris from 17 to 20 November, Makro Labelling will be participating in collaboration with Tep-France of Bezannes, Makro Labelling agent for France. On the stand, it will be presenting a MAK 1- 12P RLF Roll Feed for the North African mineral water sector and the self-adhesive and wet glue MAK 4 - 16P Ug1 Ua 3L2 Co2. Chosen by Rigoni of Asiago, one of Italy's leading producers in the high quality certified organic sector, this machine will soon be installed in the company's factory at Albaredo d'Adige in the province of Verona where it will enter into production in the packaging line for the famous hazelnut chocolate spread. Finally, from 2 to 4 December, Makro Labelling will be present at Vinitech-Sifel in Bordeaux where it will be presenting the MAK 2 - 6P Ua4 L4 Co1 self-adhesive machine with Follower 1, together with the entire range of labellers. Makro will again be taking part in this exhibition in collaboration with Tep-France of Bezannes, Makro Labelling agent for France. » Tzaw Bao proudly reports their original Taiwanese machines are still in use after 26 years.